[tweetmeme source= ‘plamere’ only_single=false] As a music application developer, I have long been vexed by a problem that has made building and releasing a music application very difficult – where do I get the music? A music application needs music – but adding music to an application is very hard. I really have just a few choices: (1) I can use unlicensed content and hope nobody notices, (2) I can try to make the deals with the labels, (3) I can restrict my app to non-demand radio and pay per-stream royalties, or (4) I can just skip the music. None of these options is very appealing to me – If my application gets popular I will either get sued by the labels or swamped by music licensing fees. It is better for me if no one notices my app at all. Even resources like album art and 30 second samples are tightly held by the content owners. What a crazy world! We are at this incredible point in the history of music with millions of tracks at our fingertips. Now more than ever, we need new ways to explore, organize and share music – but any kind of creativity in this space is stymied. I could build the coolest music app in the world that could help millions of people connect with music, but without a source of legal content, my application will never see the light of day. In my last year while working at the Echo Nest, I’ve seen some really amazing music applications made by very creative developers. These are apps that would make your jaw drop – but you’ll never see them. The apps are languishing on the virtual shelf because there’s no good way to get legal content for the apps. 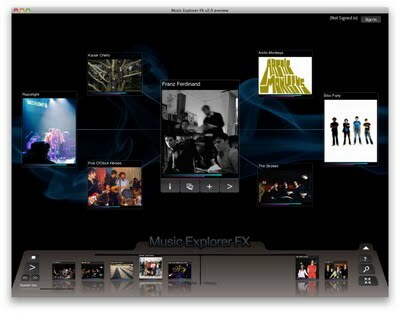 MusicExplorerFX – The award-winning Music Exploration tool. 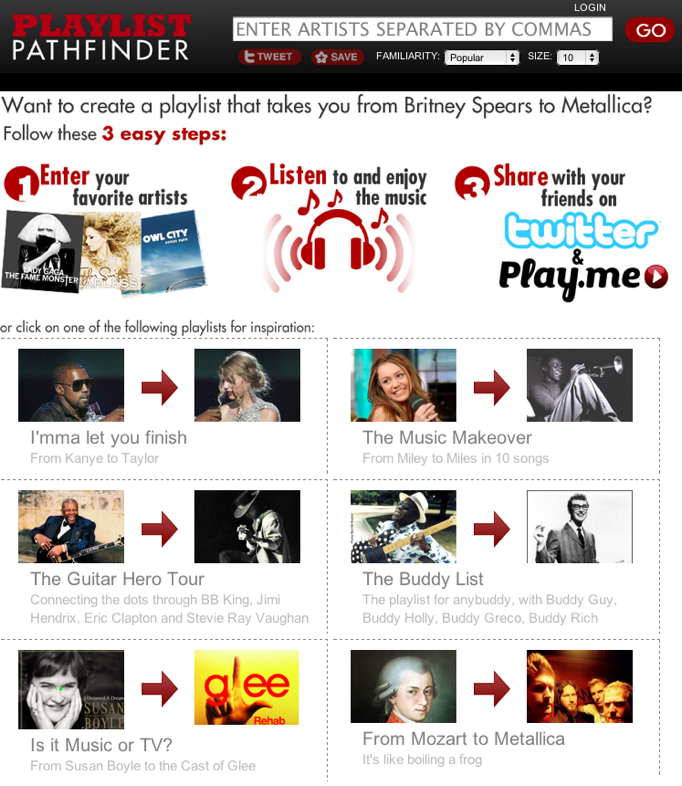 PlaylistPathfinder – a novel application that creates playlists by finding paths through the Echo Nest artist similarity space. I’ll write in more depth about these apps in subsequent posts – but the story for these apps are nearly identical – they were cool apps that were languishing on the music shelf because there was no way to release them with licensed content. Now the apps can be released to the world and even help the application developer make some money. Over the years, we’ve seen many different ways for people to discovery new music come and go. When I was growing up, the radio DJ was the primary way people people discovered new music. The DJ was the tastemaker for the generation. For the next generation, I think music apps will be one of the primary ways people discover new music. If you have idea about a cool new music app, but have been stymied by the problem of how to get content for your app, check out this program. More details will be forthcoming during Music Hack Day San Francisco. This entry was posted on May 12, 2010, 9:00 am and is filed under Music, The Echo Nest, web services. You can follow any responses to this entry through RSS 2.0. Both comments and pings are currently closed. Hey Paul, you forgot the http:// part of the MusicExplorerFX link. I’m going to check this right now, thanks for this post! I’m using Playlist Pathfinder without being logged in, so the musical clips are limited to 30 seconds, this is great for finding new music. I don’t have to click skip all the time, I rarely press skip on last.fm in less than 30 seconds anyway. And it’s enough for a song to capture my attention. Have anyone thought about making this a feature, rather than a bug? Maybe add a “continue to play” button instead of a “Skip” button. The only problem is that the clips are not always the most relevant. Maybe something could be done about this.